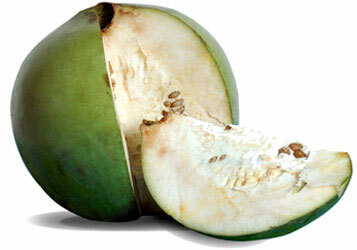 Borojo fruit has quite a reputation in South America as an aphrodisiac, a natural source of energy, and as a weight control agent. These highly nutritious fruits have long been used by native Colombians for sustained energy and vitality. The name "Borojo" means "head-shaped fruit," and perhaps it's no coincidence that the vitamins and minerals in this remarkable fruit are so helpful for maintaining mental health and acuity. Borojo fruits contain extraordinary amounts of phosphorus and essential amino acids, as well as other important vitamins and minerals vital for the health and well-being of our bodies. A recent study found that Borojo is rich in a novel antioxidant polyphenolic compound that may be responsible for the health benefits commonly attributed to the fruit. Most plant materials contain a large number of different polyphenolic compounds, but Borojo appears to be unique in the plant world in that it contains only one previously unidentified polyphenol in relatively high concentration. Borojo has a high nutritional value, being an excellent source of protein, vitamin C, calcium, and iron. It is also high in fiber, and is one of the best fruit sources of phosphorus, which can provide energy and contribute to the strength of teeth and bones. Phosphorus is also helpful for brain functions such as memory and concentration. The B vitamin content of Borojo provides support for healthy skin and muscles and may help maintain mental equilibrium. Not only that, the levels of essential amino acids in Borojo fruits are amazingly high -- three times higher than that found in meat!